Place water in the bottom half of a steamer pan set. Add salt and butter, and bring to a boil. Trim the dry ends off of the asparagus. If the spears are thick, peel them lightly with a vegetable peeler. Place them in the top half of the steamer pan set. 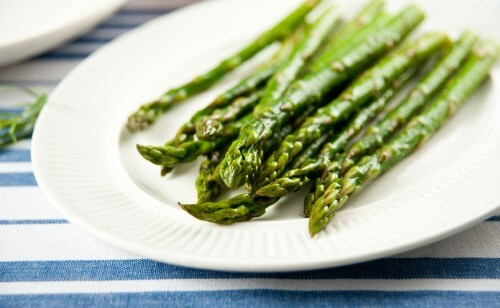 Steam for 5 to 10 minutes depending on the thickness of the asparagus, or until asparagus is tender.